​At this year's NBM show in Philadelphia, Trotec will introduce the Speedy 360 laser system, our latest innovation in laser engraving and cutting technology. New features include an optimized work area, multi-functional table concept, and our trademarked Sonar Technology for fast and easy focusing. 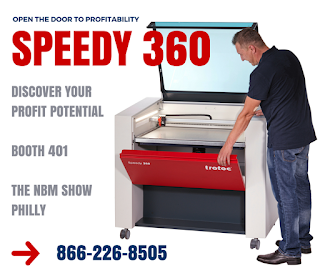 Visit us at booth #401 to see the new model in action.